The primary objective of the game remains unchanged from previous Sonic titles. 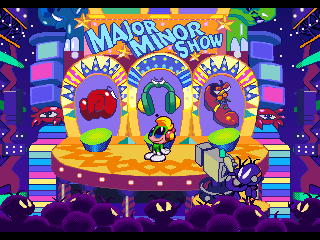 The player must finish each level in under ten minutes and defeat Dr. Robotnik's badniks along the way. Rings still constitute the player's life energy and can be collected to enter special stages. Extra lives are unobtainable in the game; once the player is damaged when he has no rings and his partner is absent (if you have no rings, getting hit will temporarily cause you to lose your partner, but he will return eventually; effectively making your partner an 'extra hit point' for the players sake) or if you use 'recall' to reduce your ring counter to negative 99 rings or lower, you will automatically be taken back to the world lobby (or back to the title screen, if you are in Isolated Island when this happens, which is also only possible through using recall, due to lack of hazardous obstacles or enemies in that level) and be given a chance to leave/save or to choose a different partner and/or try to choose another attraction to play. The game comprises 5 worlds (called Attractions), each with 5 levels. 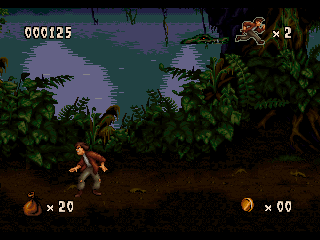 Levels are set at different times of day (morning, day, evening and night), which are determined by the time spent in the previous level and affect enemy placement and boss difficulty. At the end of Level 5, the player confronts Dr. Robotnik in one of his contraptions. The most fundamental change in Knuckles' Chaotix involves the special ring force bond between characters. In earlier Sonic games, two-player mode would consist either of a traditional split screen race or a joint single player effort with Tails as a secondary character. In the latter case, this meant that Tails could move off screen and get lost for a few seconds until he is returned to Sonic. 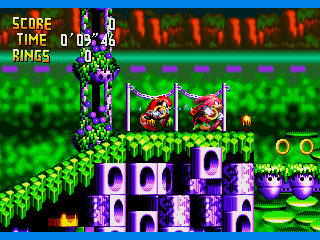 In Knuckles' Chaotix however, both players are at all times connected on one single screen while neither player acts as the dominant force to move the game forward. Besides the staple of traditional Sonic moves and individual abilities this means some new tricks can be executed with the elastic force of the ring bond. For example, player 1 can hold his position while player 2 runs forward and stretches the bond to gain maximum speed. In mid-air the bond can be used to generate an upward momentum. Additionally, players can toss each other toward platforms or use the call-button to reunite (at a cost of ten rings, which meant that for the only time the ring count could dip below zero in a Sonic game). Also, in two player mode if either player is hit without a shield/invincibility/big ring (an item that when obtained, causes you to lose all of your rings in the form of one, slightly larger than usual ring temporarily if you are hit) they lose all of their rings (which is not the case in single player mode, when if the partner is hit, he only loses one ring instead of all of them). The game cartridge features battery-backup saving, which allows the player to save their progress either manually (by passing the Exit sign) or automatically (after clearing an Act or Special Stage). All badniks and most bosses in the game are powered by, and on destruction release, gray rings (rather than animals as in prior games). However, these cannot be collected like regular rings and vanish almost immediately.